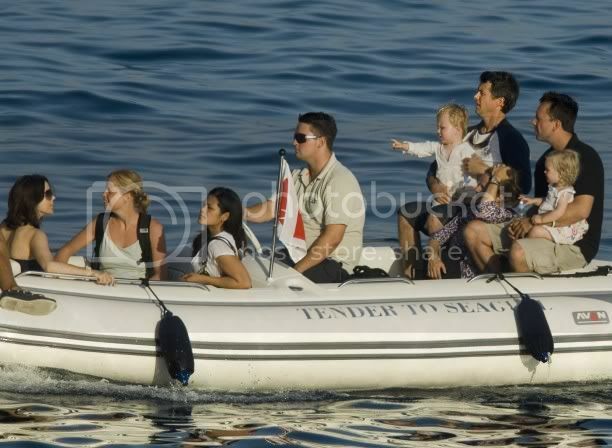 2007-07-21 Crown Prince Frederik of Denmark and Crown Princess Mary with kids Christian and Isabella ended up their cruising holiday in Croatia. 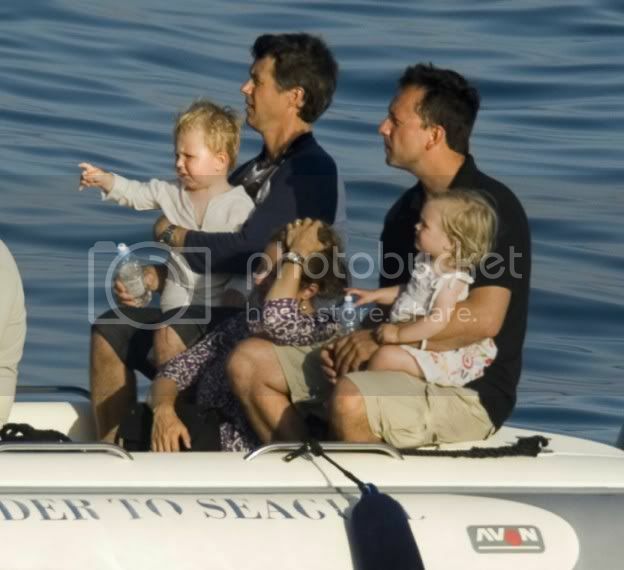 They were cruising with friends in the Adriatic aboard a rented luxury yacht, the Seagull. The holiday in Croatia was a present from Henry Jørgensen who wanted so much to show the Crown Prince Couple his beloved Croatia. Henry had recommended Mary and Frederik travel in September because it’s often hot in July and August. But a late summer holiday did not fit into the schedule of the Crown Prince Couple, so it was in July that they took Isabella and Christian on a cruise. And Henry Jørgensen was right. Mary's and Frederik’s holiday in Croatia did become warm, and not least for their two small children who were therefore dressed lightly most of the time. Little Princess Isabella was usually with a little white sunhat over her dark locks, while big brother Christian settled for an unbuttoned shirt. When Crown Princess Mary carried her little daughter around she was dressed in a strapless light and airy dress of marine blue fabric, while Frederik had chosen blue pirate pants and a thin long sleeved sweatshirt. When the sun became too strong in the middle of the day, everybody sheltered in the shade on the deck of the yacht Seagull II, but even there it could become so hot that you had to jump into the sea once in a while. Prince Christian was naturally too small to do that, but fortunately there was a small Jacuzzi on the upper deck in which he could cool his feet. The Crown Prince Couple had with them good friends, the two couples Caroline and Peter Heering and Birgitte and Jeppe Handwerk. 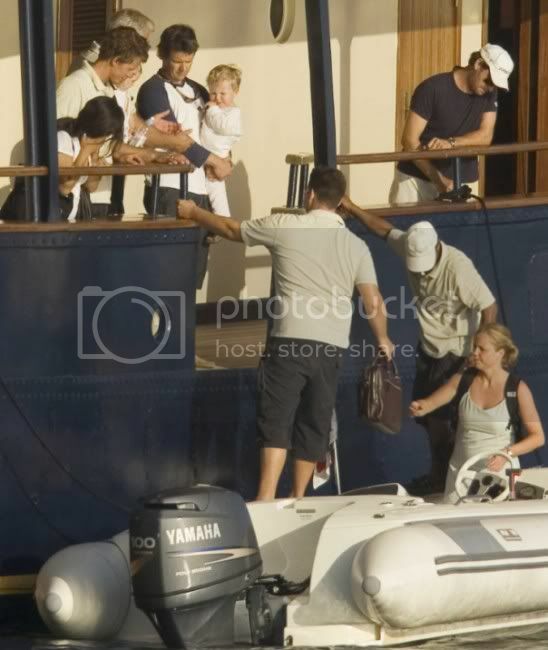 Their children too sweltered in the heat but they still enjoyed the days onboard, where India Handwerk and Prince Christian played well together. They are basically of the same age, while Emilie and Rosemarie Heering are a bit older. It can be presumed that the pregnant Birgitte Handwerk had her problems with enduring the heat. The dream vacation at sea was a present to the Crown Prince Couple from the Dane Henry Jørgensen, and because he is so enchanted by Croatia and the islands off Croatia, he had laid out a route in order for Mary and Frederik and their friends to see as much of the beautiful places as possible. Even though a lot of the islands are uninhabited, you can easily go ashore, but whether the Crown Prince couple did that or whether they preferred to stay onboard with the little ones has not been disclosed to Henry Jørgensen yet. Muhler also notes there is also a background feature on the 74 year old Henry Jørgensen who presented Mary and Frederik with the cruise. He is himself married to a Croatian. They live for half the year in Denmark and in the other half in Croatia. Seagull II is owned by the wealthy Croatian Juroslav Buljubasic, but Henry J. has been in charge of refurbishing and rebuilding the ship for luxury cruises. The ship is at his disposal for a period each year. Henry Jørgensen wrote to the court and proposed a cruise for the Crown Prince Couple in the Adriatic. He was then asked to a meeting at the office of the chief of court, Per Thornit. Mary’s lady-in-waiting Caroline Heering and a couple of gentlemen from PET (Danish security) were also present. He made it clear that this was to be considered a gift without any conditions or other motives. Frederik joined the meeting towards the end and they all agreed.